You'll be £13.50 closer to your next £10.00 credit when you purchase Axis Armoured Fighting Vehicles of the Second World War. What's this? 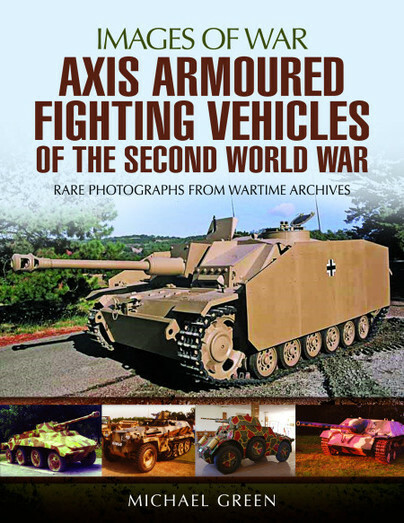 During the Second World War the Axis powers, most prolifically the Germans, deployed a vast array of armoured fighting vehicles to support their tanks and infantry. These included tank destroyers, reconnaissance vehicles, self-propelled artillery pieces, flame-thrower vehicles and self-propelled artillery pieces. Armoured tank destroyers, such as the Marder series, the Nashorn, Jagdpanther, Jagdtiger and the turretless German Stu III series (based on the Panzer III medium tank), helped the Nazis overcome their shortage of tanks. Copying the Stu III series the Italians created the turretless Semovente da 75/18 assault gun and the Hungarians the turretless Zrinyi. In the role of self-propelled artillery the German fielded the Hummel, the Wespe and the Grille while the Brummbar and the Sturmtiger performed in the dedicated assault gun role. For armoured reconnaissance German industry came up with a series of capable armored cars; examples were the eight-wheel Puma and the full-tracked Luchs reconnaissance tank. The Italians developed the impressive four-wheel Autoblinda armoured cars. Specialized anti-aircraft tanks such the Mobelwagen, Wirbelwind and the Ostwind gave some protection against the ever more powerful Allied air forces. This fine book covers all these variants and many more besides in words and rare images and will delight readers, collectors, model-makers and war-gamers. Ideal for military historians, equipment buffs, model makers, war gamers and collectors, it is an affordable and authoritative addition to the popular Images of War series. A really impressive Visual Documentation. A recent addition to the Images of War series of books from Pen and Sword, and another from well known author Michael Green. As usual, he provides knowledgeable text accompanied by a fine selection of photos to illustrate that text. There is a good mix of archive and modern colour photos showing the wide variety of surviving examples from museum and private collections around the world, each with useful captions.